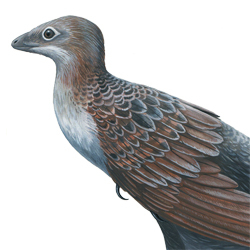 Diagnostic anatomical reconstruction of Deinonychus antirrhopus, intended loosely for Wikipedia but also as an experimental piece to show pretty much exactly how I believe this animal looked in life. This was largely inspired by an interesting Facebook discussion with paleoartist Julius Csotonyi about arm-folding in paravian dinosaurs. It occurred to me that people seldom reconstruct paravians, particularly dromaeosaurs, with their arms folded in a reasonable and accurate way. Julius made the fair the point that these animals probably didn't carry their arms out in front of the body, as is so often depicted (in skeletals and otherwise — it makes sense in skeletals, to adequately show the hand and arm anatomy), because such an awkward orientation would leave the hand and arm feathers open to damage and breakage. But they also can't fold them tightly against the breast or back like birds do, because they lack the mobility to do so. 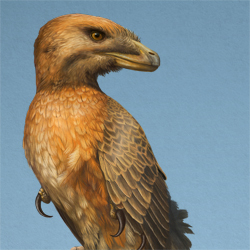 So how did Deinonychus normally carry its arms? Senter's 2006 paper on forelimb function in Deinonychus and Bambiraptor shows that the humerus couldn't rotate much past the horizontal with respect to the scapula. In addition, Sullivan et al. 2010 — winningly translated to layman coherency by Matt Martyniuk — shows that wrist mobility in many paravians is much less than you might expect, given their similarity to birds. The wrist of Deinonychus antirrhopus specifically would not have allowed it to bend its hands even 90° with respect to the arm! Given these limitations, most of the flexion would have to occur at the elbow, but a fully flexed elbow would mean that the hands would be hanging below the body, not held sleek and secure alongside the body. The arm orientation in my illustration above is based on what I think is probably the perfect configuration for carrying the arms: a fully-flexed shoulder, a fully-flexed wrist, and a nearly fully-extended elbow. A few other people have drawn their dromaeosaurs with the same arm configuration, like Smnt2000 and Pilsator, so kudos to them. Illustration based on the papers linked above as well as Scott Hartman's beautiful skeletal. Gouache on 12" x 20" hot-pressed illustration board.